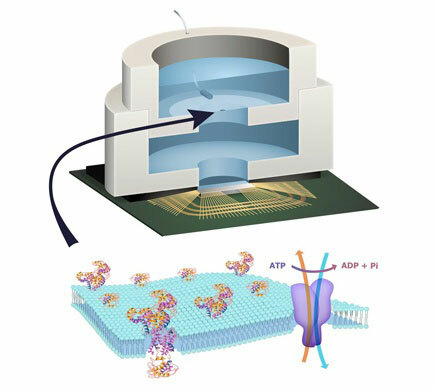 (Nanowerk News) Columbia Engineering researchers have, for the first time, harnessed the molecular machinery of living systems to power an integrated circuit from adenosine triphosphate (ATP), the energy currency of life. They achieved this by integrating a conventional solid-state complementary metal-oxide-semiconductor (CMOS) integrated circuit with an artificial lipid bilayer membrane containing ATP-powered ion pumps, opening the door to creating entirely new artificial systems that contain both biological and solid-state components. The study, led by Ken Shepard, Lau Family Professor of Electrical Engineering and professor of biomedical engineering at Columbia Engineering, is published online Dec. 7 in Nature Communications ("Hybrid integrated biological–solid-state system powered with adenosine triphosphate"). Shepard, whose lab is a leader in the development of engineered solid-state systems interfaced to biological systems, notes that despite its overwhelming success, CMOS solid-state electronics is incapable of replicating certain functions natural to living systems, such as the senses of taste and smell and the use of biochemical energy sources. Living systems achieve this functionality with their own version of electronics based on lipid membranes and ion channels and pumps, which act as a kind of “biological transistor.” They use charge in the form of ions to carry energy and information—ion channels control the flow of ions across cell membranes. Solid-state systems, such as those in computers and communication devices, use electrons; their electronic signaling and power are controlled by field-effect transistors. In living systems, energy is stored in potentials across lipid membranes, in this case created through the action of ion pumps. ATP is used to transport energy from where it is generated to where it is consumed in the cell. To build a prototype of their hybrid system, Shepard’s team, led by PhD student Jared Roseman, packaged a CMOS integrated circuit (IC) with an ATP-harvesting “biocell.” In the presence of ATP, the system pumped ions across the membrane, producing an electrical potential harvested by the IC. The ability to build a system that combines the power of solid-state electronics with the capabilities of biological components has great promise. “You need a bomb-sniffing dog now, but if you can take just the part of the dog that is useful—the molecules that are doing the sensing—we wouldn’t need the whole animal,” says Shepard. “With appropriate scaling, this technology could provide a power source for implanted systems in ATP-rich environments such as inside living cells,” added Roseman.